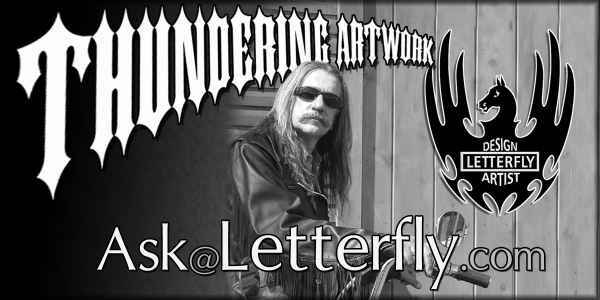 Or, you may simply type Artist (at) Letterfly (dot) com into your e-mail window. You may contact the Letterfly.com Artist by e-mailing the address shown above, or by writing to the postal address at the bottom of this page. You may, if you wish, click the image or click here to create an e-mail already addressed to me (but be sure to EDIT the TO address so that the domain reads letterfly.com. If you are writing to inquire about a specific picture, please be sure to include the filename of that picture (or the name of the web page on which you saw that picture) in your e-mail. The filename of the picture should be displayed on the page with the single image. If you are a Harley-Davidson Owner's Group (HOG) newsletter editor asking permission to include one of my articles or pieces of clip art in your newsletter, permission is hereby granted. Please send me a courtesy copy of the newsletter, as I enjoy reading HOG news from around the country.